Verbalink is a transcription company that hires transcriptionist to work from the comfort of their own homes. They have been around for a while but were previously known as Escriptionist. They are generally considered a reputable company in the work-at-home community and there was very little negative to be found about them. In fact, the worst I found was that the test they give potential contractors is hard. Verbalink does not list their pay on their website nor does anyone in any of the forums reveal a pay rate. I emailed the company for more information, and while they confirmed my suspicion that they only reveal their pay rates to their contractors, they believe in paying a living wage. They offered a link to an article further explaining their belief in this here. They also explained that they pay weekly via PayPal, which is always good to hear. Those in the know that did express an opinion on pay felt it was a fair wage, and actually average or above average for the industry. How do I Apply for Transcription at Verbalink? 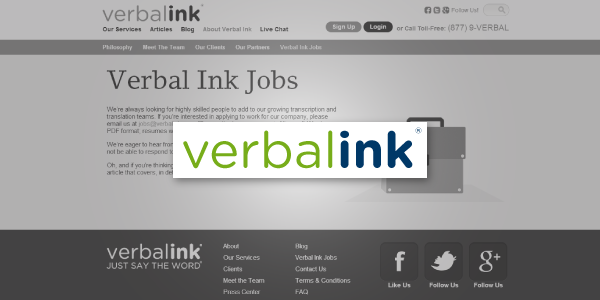 Send an email to jobs@verbalink.com with a resume attached in either a Word Document or PDF. They are very clear that resumes without a cover letter will not be considered. Verbalink also stated in their email to me that all of their contractors work in the United States. From all appearances this is a reputable transcription company that pays fairly. Verbalink is not necessarily easy to get an offer for transcription work. However, if you are offered a transcription job at Verbalink and later decide you want to quit your position- make sure to take the decision to let Verbalink go seriously. At least one person noted that they left and tried to go back only to be told Verbalink does not rehire. Another transcriber noted that they offer some scheduling flexibility. It has been noted that you can tell them what you can handle in a specific week and they will do their best to oblige based on work availability. If you have more information about Verbalink we would love to hear it, and good luck to all who apply! Really good article. Thank you Faith.